President Donald Trump lambasted Palestinian Authority Chairman Mahmoud Abbas, after the president claims the PA leader deceived him regarding his party’s involvement in anti-Israel incitement. 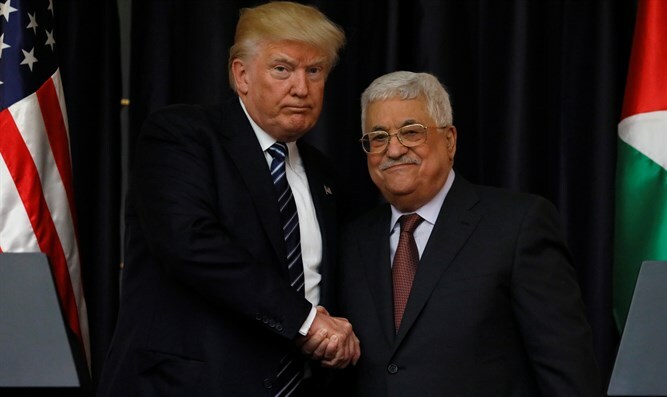 Trump met with Abbas in the PA-controlled city of Bethlehem last week during his two-day visit to Israel. The two held a joint press conference, at which time the president praised Abbas’ commitment to restarting negotiations with Israel for a final status agreement. But according to a report by Channel 2 Sunday evening, the closed-door meeting between the president and the PA chairman was anything but cordial. A US official present during the meeting claims the president expressed outrage with Abbas, yelling at him regarding Abbas’ claims that his Fatah faction was not involved in anti-Israel and anti-Semitic incitement. During his March get-together with the president, Abbas claimed he was dedicated to advancing peaceful relations with Israel, and that the PA was not engaged in incitement against the Jewish state. Prime Minister Binyamin Netanyahu publicly called out Abbas’ claim, noting the PA’s continued material support for jailed terrorists and promotion of hateful propaganda encouraging young Arabs to take up arms against Israel. "I heard President Abbas yesterday say that the Palestinians teach their children peace,” said Netanyahu. “Unfortunately, that's not true. They name their schools after mass murderers of Israelis and they pay terrorists,” he said at the opening of a meeting with the Romanian prime minister in Jerusalem. According to the American official who spoke with Channel 2, beyond the PM’s statement, Israel also provided the White House with proof of the PA’s support for and promotion of terrorism. “You talked to me about peace, but the Israelis showed me that you are personally supporting incitement,” Trump reportedly told Abbas last week. During their joint presser last Tuesday, President Trump alluded to the PA’s funding for jailed terrorists, calling it an obstacle to peace. "Peace can never take root in a place where violence is tolerated, funded and even rewarded,” said President Trump. “We must be resolute in condemning such acts in a single, unified voice. Peace is a choice we must make each day, and the United States is here to help make that dream possible for young Jewish, Christian, and Muslim children all across the region."